You might have a friend, family member or colleague who’s blind or has low vision. Or you might pass by a blind or low vision person in the street who seems to need assistance. If you are with someone who is deafblind, you might want to know how to help and communicate with them. Read the information below to find out ways to approach someone that might need some help. Don’t forget to ask first and please don’t be offended if they turn you down. Ask first – don’t assume assistance is required. They are the best person to tell you how to help. Speak naturally – unless they have a known hearing loss there is no need to change your voice. Don’t be afraid to use words like see, look and watch. People who are blind or have low vision use them too. When you enter a room always say hello, identify yourself by name and say when you are leaving. If you are in a group situation ensure everyone knows who is in the room. Introduce others in the group and use people’s names so the person who has low vision or is blind knows who you are speaking to. If a person is accompanied and you have a question or comment for the person who is blind or has low vision, address them directly, not the person they are with. If you are need to touch or guide someone, let them know what you are doing before you do it. Say: “I’m just going place my hand under yours to assist you to locate your cup”. When guiding let the person take your arm, do not push or pull. Initiate contact by lightly touching their arm or hand and explain where you are going. Do not leave a person in space – ensure they have a reference point such as a seat or a wall. Verbally let the person know of any obstacle or notable information such as stairs and doors. Give clear instructions and directions, such as the cup of tea is on your right, avoid “here” or “there”. Advise the person if you leave an item for them i.e. if you bring their meal to their room describe what you have brought and place it where they can safely and easily access it. Never leave items lying around e.g. keep passages and walkways clear, close cupboards and leave doors fully open or closed. Always put items back where you found them. Make the best use of available lighting – lighting requirements are individualised – ask the person what is most useful. In general keep lighting even throughout the facility and manage glare. Contrasting colours can help, e.g. put a light coloured plate on a dark placemat. Do not interact with guide dogs whether they are working or not. Seek the permission of the handler if the dog is not currently working. Distracting a guide dog while it is working can be dangerous. Check out our Guide Dogs section to find out more. Most importantly treat a person with dignity and respect. Thank you for making that extra effort! You should always ask first if a person needs assistance. Do not take hold of the white cane or guide dog – breaking their or their guide dog’s concentration can be very dangerous. Be precise when giving directions – “go straight ahead about 20 metres” is much clearer than “over there”. As a driver if you think a pedestrian needs assistance, drive past before stopping so your car does not block them from the view of other traffic. Ask the person which side they’d like to be guided on (or stand on the opposite side of their cane or guide dog). Let them take your arm above the elbow (your arm can be straight or bent). They will then walk about half a pace behind you following your movements up or down steps or around obstacles. Keep your arm close to your body so that the person you are guiding can follow your movements. 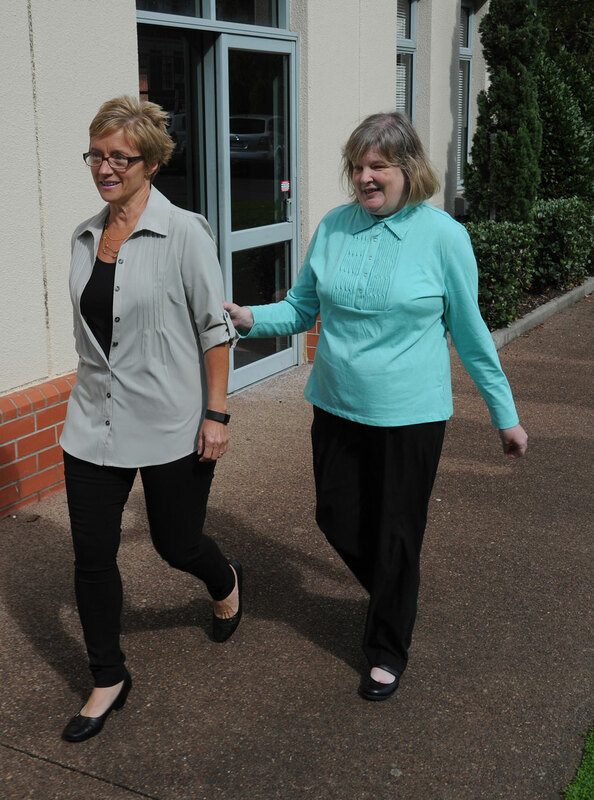 Before stepping off or onto a kerb or stairs, pause and tell the person you are guiding that is about to happen – “two steps down” or “a flight of stairs up”. Let the person know that you are leaving them. It can be embarrassing to be left talking to thin air! Guide them to the door they will be entering and state which door it is i.e.” the car is facing left, this is the back passenger door”. Place the hand of your guiding arm on the door handle and let them slide their hand down your arm to it. When your passenger is getting out of your car you should first check that the area is clear and safe for them to exit. Once they have exited the car offer your arm and guide them to their requested destination. Do not take the arm of a person who is blind or has low vision. It is very uncomfortable being pushed or pulled. You are welcome to download a brochure about Guiding Tips (.pdf).